Seasonal Lockets with Charms for Winter, Spring, Summer and Fall! Here are some great ideas for wearing the seasons in your locket. This is great for someone who wants to be able to change their locket, but does not have time to change it everyday, or maybe wants to just start out small. 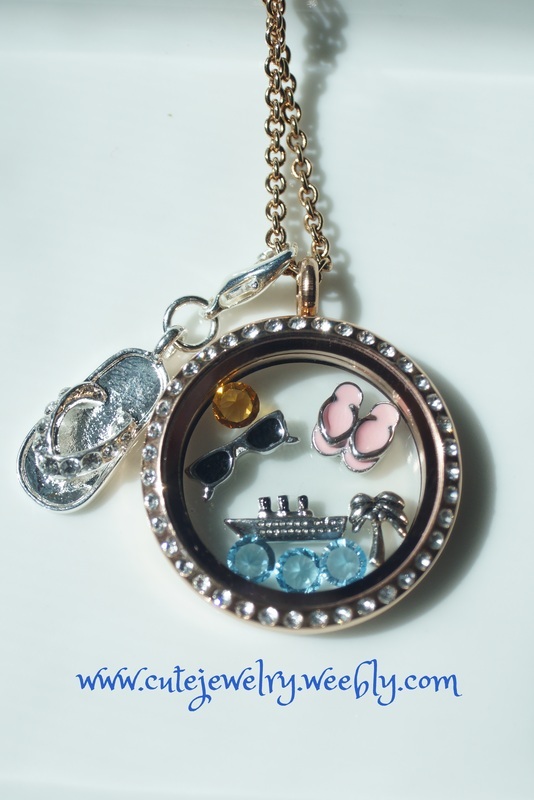 Check out these awesome ideas to use South Hill Designs charms in your floating locket! I absolutely love the simplicity of this locket. This reminds me of a quiet winter, the extra darkness for hibernation, and snow! And how much fun is it to ice skate at night? 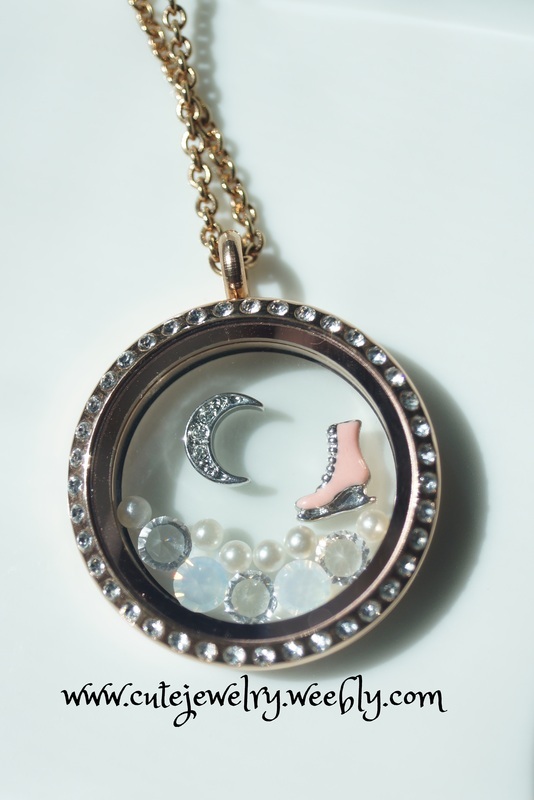 If you want to duplicate this locket, you will need a large locket (your choice of Silver, Gold, or Rose Gold, with or without Swarovski Crystals), the Crescent Moon Charm, the Pink Ice Skate Charm, three April Birthstone Swarovski Crystals (clear), two White Opal Swarovski Crystals, and six Vanilla Pearls. Spring is all abuzz with the wakening of the earth after it's rest. 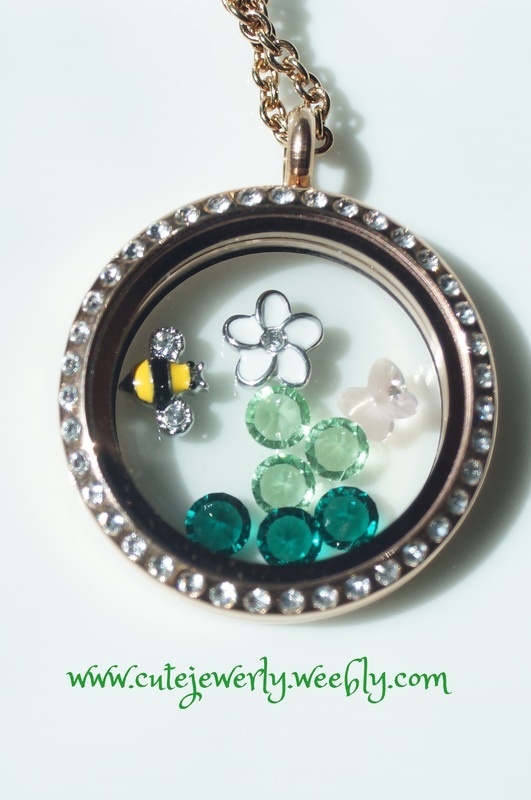 I love this Spring locket, because it represents the fresh green grass, new flowers, and beautiful flying creatures such as butterflies and bumble bees. 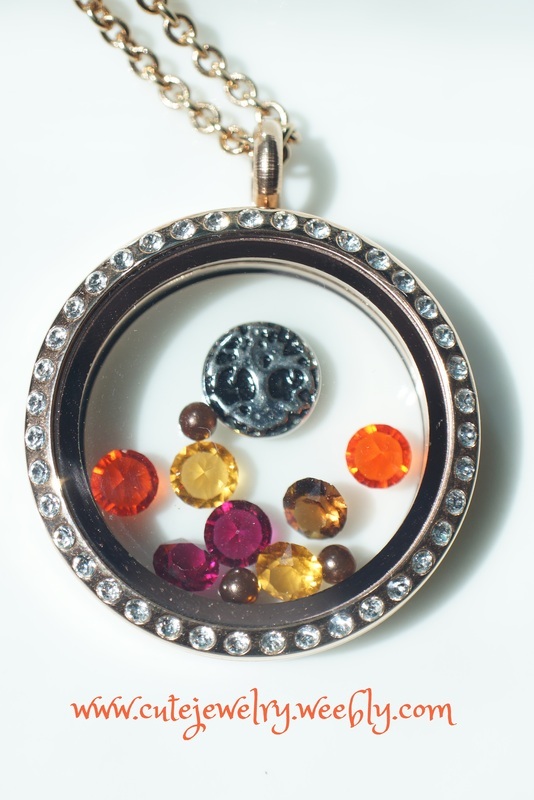 This locket represents what South Hill Designs is all about--using your imagination to create what is special to you! To duplicate this locket, (your choice of Silver, Gold, or Rose Gold, with or without Swarovski Crystals), three May Birthstone Swarovski Crystals, three August Birthstone Swarovski Crystals, the Amethyst Butterfly Charm, the Bumble Bee Charm, and the Plumeria Flower Charm. Talk about Cute Jewelry! Summer to me is all about vacations, sunshine, playing in the water, and most important--Flip Flops! This Summer locket represents my most favorite things about summer, but the great thing about South Hill Designs is the fact that you can make your locket all about YOU! :) To duplicate this locket, (your choice of Silver, Gold, or Rose Gold, with or without Swarovski Crystals), one November Swarovski Birthstone Crystal, three March Swarovski Birthstone Crystals, the Sunglasses Charm, the Pink Sandals Charm, the Palm Tree Charm, the Cruise Ship Charm, and the Crystal Sandal Droplet. As much as I love all of the season, I think I love this Summer seasonal locket the best! Gold, with or without Swarovski Crystals), the Tree of Live Charm, three Hazelnut Pearls, two Hyacinth Swarovski Crystals, two July Birthstone Swarovski Crystals, one Smoked Topaz Swarovski Crystal and two November Birthstone Swarovski Crystal. However, we have so many crystal and pearl choices, you could easily mix and match the colors that represent fall to you! You could also add the Cup O Joe Charm too! All Content and Pictures belong to Leanna Sutliff ofwww.cutejewelry.weebly.com. Nothing may be used without written permission. Copyright 2013.